Watts Antenna Company’s model GP5-A1 provides smaller critical areas for Category I/II/III Instrument Landing Systems. Watts has recognized that worldwide engineering practices employed to overcome difficult site problems with image glide path (GP) antenna systems indicate that the antenna lateral radiation pattern is being substantially challenged in the modern airport environment. Introduction of larger aircraft such as the Airbus A380 and airport efficiency constraints are also driving a reduction in the size of the critical area of the Glide Path system in order to take advantage of the larger jets and to increase airport capacity. The Model GP5-A1 Antenna element, nomenclature GP5-A1, has been designed and manufactured by Watts Antenna Company to provide highly accurate guidance information to an approaching aircraft while permitting increased flow of aircraft traffic in the vicinity of the GP tower. The initial development was undertaken by the manufacturer starting in the fourth quarter of 2003. Directive, narrow beam produces optimum pattern in airport multipath environments. Rejects sources of both static and dynamic multipath on the side of the runway containing the tower. Figure 2. 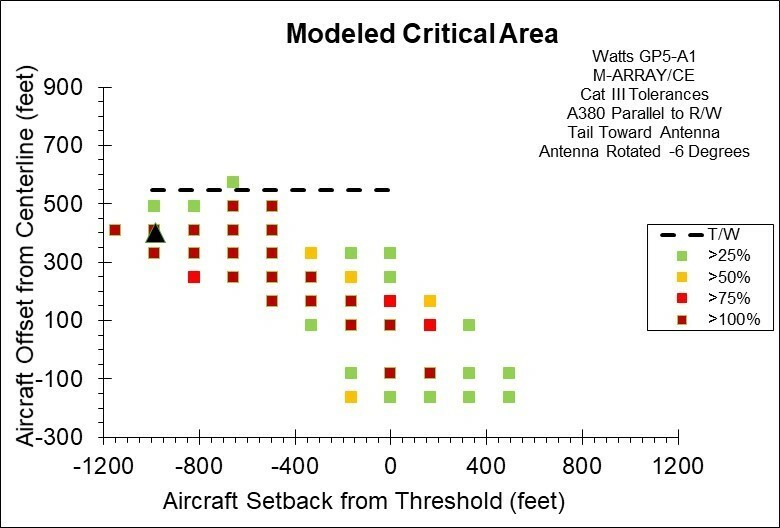 Computed ILS Glide Slope Critical Area for an Airbus A380 Parallel to the Runway Using the Watts Model GP5-A1 Beam Steered Directional Antenna in M-Array Configuration, also referred to as Capture Effect (CE). 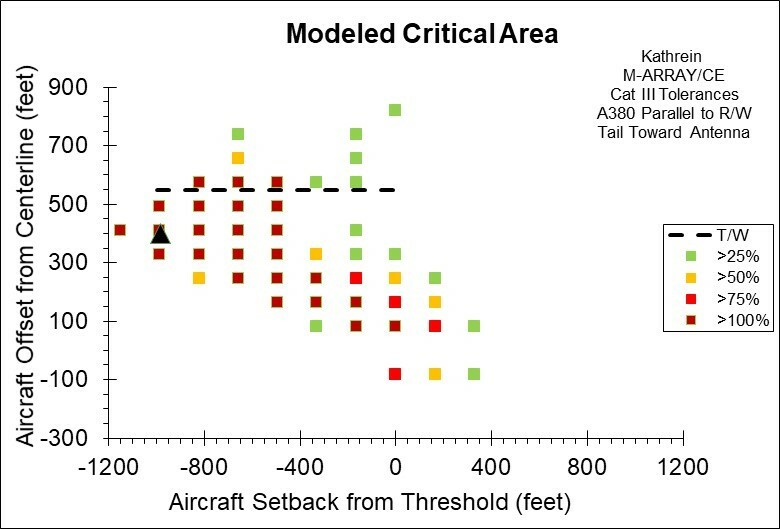 This Figure Shows the Addition Critical Area Reduction Achieved by Mechanically Rotating the Already Canted Beam by an Additional 3.0 Degrees Toward the Runway. 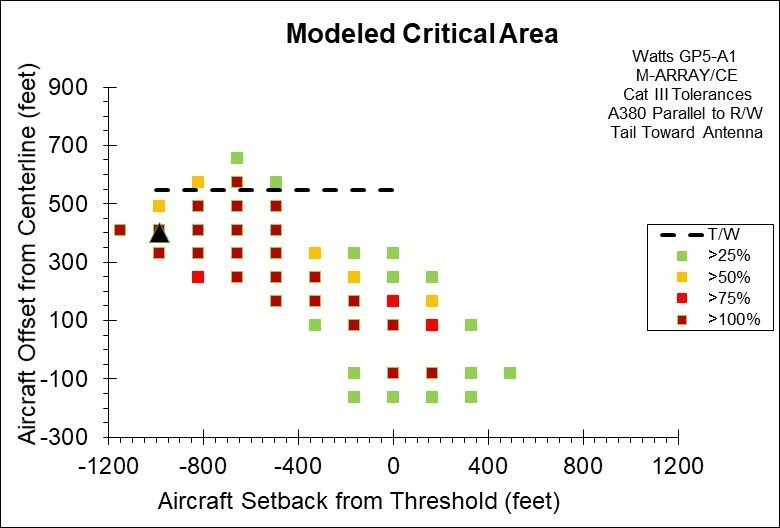 The Dashed Line on the Plot Represents a Taxiway Offset Distance Where the Tower to Wingtip Separation is Only 5 Meters (16.4 Feet). The Black Triangular Shape Represents the Location of the Glide Slope Tower. Figure 3. Computed ILS Glide Slope Critical Area for an Airbus A380 Parallel to the Runway Using the Watts Model GP5-A1 Beam Steered Directional Antenna in M-Array Configuration, also referred to as Capture Effect (CE). 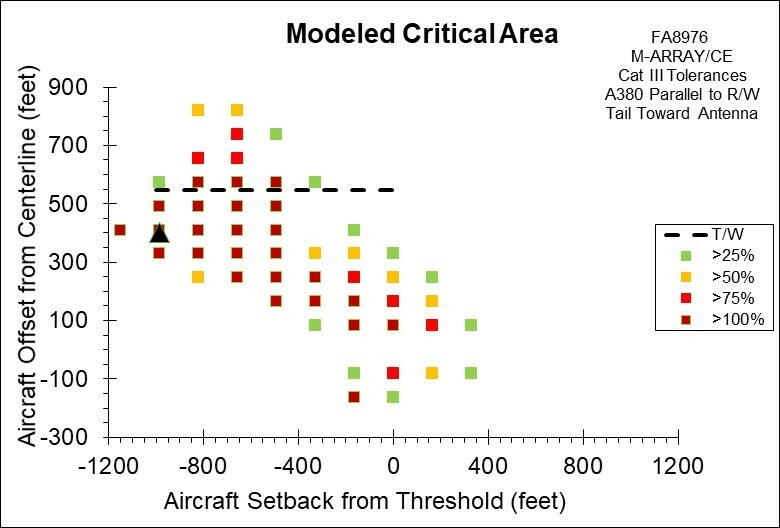 The Dashed Line on the Plot Represents a Taxiway Offset Distance Where the Tower to Wingtip Separation is Only 5 Meters (16.4 Feet). The Black Triangular Shape Represents the Location of the Glide Slope Tower.